Josh Neill was back for Hawick Royal Albert after an ankle injury (archive image). The last time Hawick Royal Albert played Arniston Rangers, the match descended into infamy. 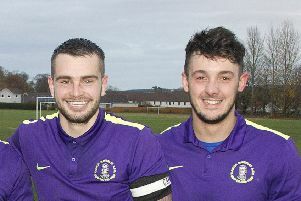 The September 29 encounter at Albert Park – which Hawick won 1-0 – was littered with incidents and produced three red cards, with heavy suspensions following for the two Albert squad members who were dismissed. However, Albert boss Paul McGovern stressed the encounter was very much a distant memory, and he would be emphasising that to his players ahead of their scheduled visit to Gorebridge tomorrow (Saturday). “What’s gone on in the past is over now – we have to eradicate that and focus on the game in hand,” he said. “My sole focus on Saturday will be about going there, putting in a shift and hoping to get a result. McGovern has been looking at several trialists in training this week and is thinking about who, if any, he may take to Hunterfield Road. Regarding last week, the gaffer made no secret of his disappointment following his team’s performance agaisnt Leith Athletic. The Albert lost 4-0 – their third straight defeat, with no goals scored and 13 conceded in that time. They played well in the first half, having a squad of only 14, with a couple of trialists, and, although lacking firepower up front, they looked good defensively. But they were rattled by a Leith goal from a free kick in first-half stoppage time, with the ‘keeper and defenders leaving it to each other to attack the ball as it sailed towards the target. McGovern said after Leith’s second goal went in, a number of the players seemed to accept defeat, which was very disappointing. Poor defending was to blame largely for the goals but McGovern made it clear he was unhappy with the reaction of some ofhis troops. The squad was very light up front, admitted McGovern, and ideally needed more strikers – while they could also do with midfielders getting in among the goals and defenders posing an aerial threat at set pieces. The search, as ever, was continuing for potential new additions to the team, which was quite varied in its composition because of injury, suspension, work commitments or other unavailability. Leading scorer Josh Neill was back on Saturday after a fairly lengthy lay-off caused by an ankle injury, but was obviously short of match fitness, said the gaffer, while Demba Thiam is available again after suspension – ironically imposed after the previous game with Arniston. Last Saturday, reported John Slorance, the sun was out in a clear, blue sky but there was only sunshine on Leith at Peffermill. For, in the single match to escape the wrath of the wintry weather in East of Scotland Conference League circles, Leith Athletic completely outshone the Albert. Hawick had their bright moments during the first half but, in the second period, failed to come out of the traps. Manager McGovern said: “I thought we were as good as Leith in the first half. “However, Leith scored a goal two minutes into injury time at the end of the half and this was a sore one for us. “Our reaction to this was poor, for we were never the same side in the second half. Albert keeper Craig Saunders pulled off two saves during the opening exchanges, when keeping out efforts from Kyle Mitchell and Marc Molloy. Hawick then showed what they had to offer when Dom Pacitti floated over a corner kick, which Michael Johnson headed goalwards. Matthieu Lantoine, however cleared, the danger. Minutes later, Lewis Knox had an apparent close-range goal ruled offside. Knox then had a great opportunity to open the scoring when put in the clear by a Pacitti pass but failed to cash in, shooting tamely at Leith keeper Ben McGinley. 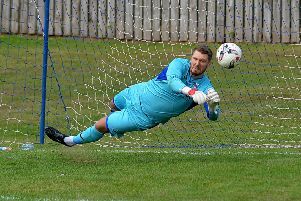 Leith, in turn, were denied an opener when Saunders pulled off a fine save from a well-struck Sonny Swanson free kick. A no-scoring first half appeared to be on the cards but, two minutes into overtime, Leith changed this. Taking a free kick wide on the left, Swanson unleashed a speculative shot that sailed into the far corner of the net. This was to be a lift for the hosts and a downer for the visitors after the changeover. Athletic almost added to their tally when Malloy was thwarted by a Saunders save. Mitchell was then just off target with a chipped shot, before Swanson hit the side netting with an angled drive. In the 64th minute, however, Leith got the strike they had been chasing. After running on to an Oban Anderson through ball, Stefan Hay polished off a solo run with a spot-on finish. Within three minutes, Swanson burst through the middle from a Mitchell pass to place a shot out of Saunders’ reach. It was one-way traffic after this, with Leith in the driving seat. In the 83rd minute, a fourth goal arrived, as Swanson collected his hat- trick by steering a Ryan Mayer corner kick into the net.